Direct Response Copywriting: These get good page rank but fail to convert - What you can do about it. These get good page rank but fail to convert - What you can do about it. 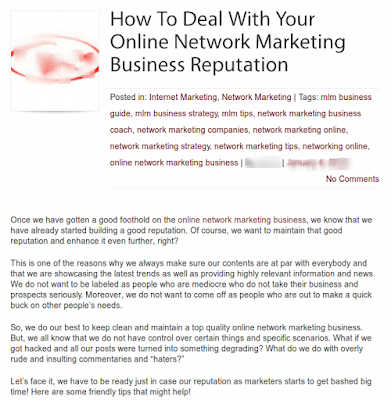 The image above came from an article that I found from a social media marketer's blog. I took a screenshot above the fold to point out how the headline should tie in with your first paragraph, and the next. The headline (or title) is the most important part of your social media communication. If your headline doesn't get your reader's attention, the rest of your brilliantly written article will never be read. The purpose of the first headline is to get the reader to read your tagline. The tagline then needs to lead their attention to the first paragraph, and so on until they read your call to action. Did you understand what the headline meant? This headline does not give us any motivation to read the rest of the article. "How to..." was a good start but subsequent words turned french and lost its meaning. This headline failed to grab the reader's attention. 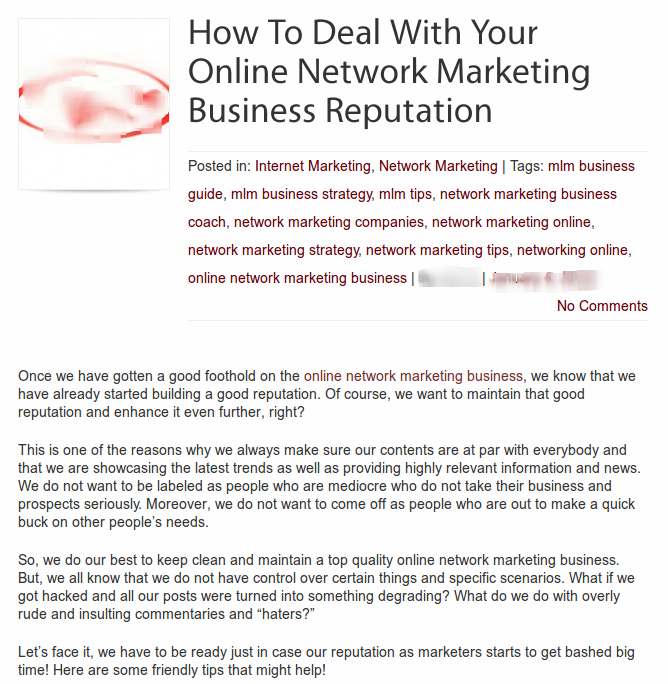 The author, wanting to optimize for search engines, chose to insert the keywords "Online Network Marketing Business" into the title. This makes it hard for the reader to understand what is being said. This article might rank well because of the keyword used, but for what price? If you read a headline like that on search results, would you click on it? Once we have gotten a good foothold on the online network marketing business, we know that we have already started building a good reputation. Of course, we want to maintain that good reputation and enhance it even further, right? There goes that SEO keyword again (online network marketing business). Totally uncalled for. In this paragraph, the author is assuming that we have read his/her previous article. We haven't. Why assume that? And what is the point of making a reference to a previous article? Understanding SEO, you can see that the author prioritized SEO by making that reference and giving us the link. There are a number of subtle ways to do that. But looking at the context of the article, I think that reference and the link was unnecessary. Dear author, if you care more about web crawlers finding your keywords, then I am better off reading my friends' status updates on Facebook. This is one of the reasons why we always make sure our contents are at par with everybody and that we are showcasing the latest trends as well as providing highly relevant information and news. We do not want to be labelled as people who are mediocre who do not take their business and prospects seriously. Moreover, we do not want to come off as people who are out to make a quick buck on other people’s needs. These are a mouthful. Break down your thoughts into short sentences. Get to the point. Don't talk about yourself. Talk benefits for the reader. Always. Did you notice that this article reads like "academic" writing? I can't give you the link, but the rest of the articles in that blog all read the same way. The rest of the article doesn't have to read like an essay. If you want to proofread for readability, have a ten year old read what you wrote. If they understand what you wrote, everyone else will get your message. Remove the list of tags (categories or labels) from under the title of the article. Remember, write for people who read, not for web crawlers.